Recently I was asked to do a blog for our local newspaper weekly for a month (you can see the first post here) which has left limited time for my own usual blogging. But I did want to throw out a quick reminder of some of our best local delicacies. 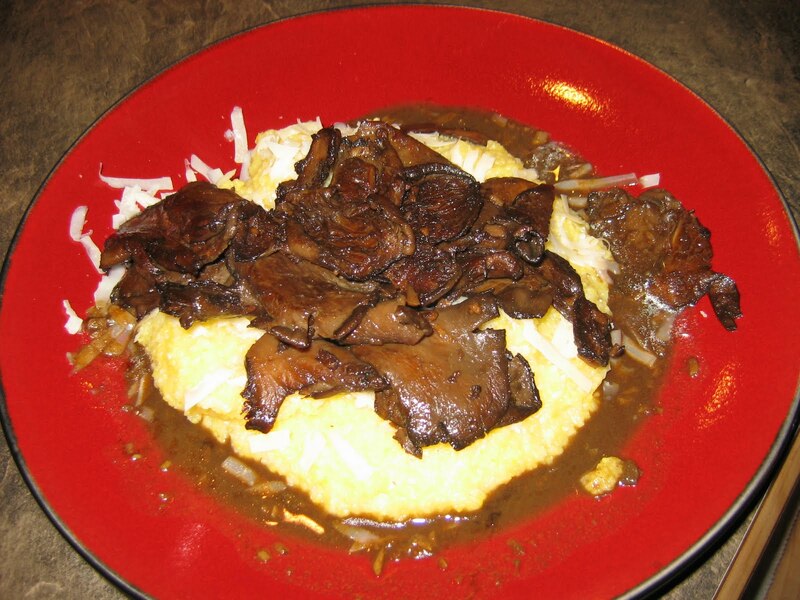 Among my favorites are the lovely pearly oyster mushrooms from Exotic Edibles of Edgewood, available at the downtown growers’ market and at both Albuquerque branches of La Montanita Co-op.They are delicious roasted and served over polenta. First make polenta by your favorite method.I like to put one cup of good organic polenta (not any other type of cornmeal) in an unglazed clay cookpot with 3.5 cups of water ad a teaspoon or so of salt. I set the clay pot over medium-low heat, covered, and after ten minutes or so I increase the heat a little, to medium. At some point 15-20 minutes later when the pot is simmering, I stir well and turn the heat to very low; you may need a flame-tamer device if your stove runs hot. It now simmers slowly, covered, for a couple of hours while I do other things. I don’t stir. It’s very like the well-known oven method but relies on the kindly heat of clay. When ready, either stir in some grated Parmesan or pour it into a pan to solidify. You can then cut thick slices to grill and use as “landings” for all kinds of food. I buy oyster mushrooms by the pound, and a pound is the minimum amount that you need to serve 4 people. Personally, if four hearty eaters were expected at my table, I would get two pounds of mushrooms and double the seasoning ingredients. Pick them over and cut off the tough stem end. I don’t wash them, since I have seen the operation and have no concerns that anything unwholesome is on the mushrooms, but suit yourself. Toss in a large bowl with 3 large or 5 small chopped cloves of garlic, 1/4 cup of olive oil, a tablespoon of soy sauce, and a little chopped celery leaf if you have it. The soy does not add an Asian taste, it just gives a rich meaty savor. Spread the mushrooms on a baking sheet in one layer and roast in a 425 degree oven until they are cooked, somewhat browned, and have exuded juices. Put the mushrooms in a bowl, and if there’s half a cup or less of pan juices, pour it over the mushrooms and serve over hot polenta with shavings of good Parmesan. If you washed your mushrooms, there may be a lot of juice, in which case boil it down in a little saucepan until reduced to half a cup, then proceed as above. A thick pat of very good butter on top of each serving adds a wonderful touch of richness and flavor. If you want to add herbal notes, you can garnish with some finely chopped celery, or you can add a couple of teaspoons of fresh thyme leaves to the raw mushrooms with the other seasonings. Any way you choose to proceed, it’s a wonderful dish for fall, and the main ingredient comes form one of our most interesting and waterwise farm operations. Scott and Gael, the mushroom people, have to truck in all their water, and they don’t waste a drop. For more about their operation, see my website.